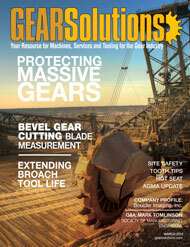 Traditional bevel gear cutting blade inspection machines have three linear axes for setup. 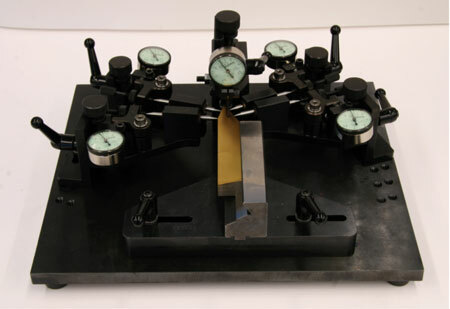 One of the three axes is used for advancing the blade towards a mechanically or opto-electronically functioning measurement probe. In many cases the blade is inclined versus the major measurement plane by the angle of the cutter head slots of the particular blade type and perpendicular to the sides of the blade shank. This results in three linear freedoms of blade movements in connection with one to five probes and one inclination (commonly realized with a tapered block). The Gleason No. 562, shown in Figure 1, is an example of a manually operated blade inspection device as described above. The blades are inclined at the same angle of the slot inclination in the respective cutter head. 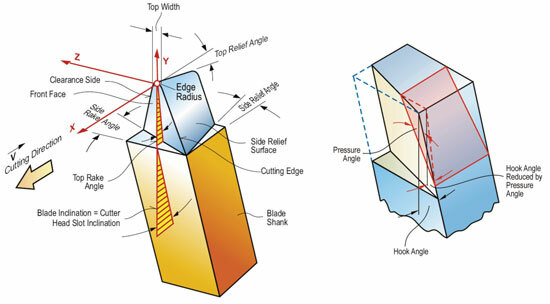 The blade geometry is described in the offset plane of the cutter head. The offset plane in face milling cutters is approximately the normal plane to the cutting velocity (offset plane ≈ cutting plane). 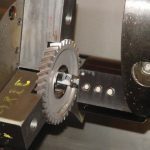 In face hobbing cutters, the offset plane is designed to be close to the cutting plane for the majority of the gear designs considered to be cut with the particular cutter. The formulas used to compute the coordinates in Figure 2 pre-select the vertical points (Abscissa) in the sketches on the blade contour and then calculate the pin center coordinates of the different points. The negative vertical direction (Abscissa) is defined as Y-axis and the horizontal axis, pointing to the left is the X-axis. 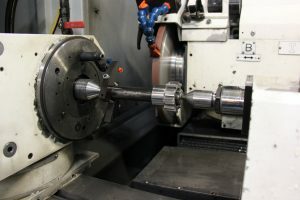 The Y-axis has a distance to the blade shank of 2.54mm (0.1inch) and the X-axis has a distance of 2.54mm (0.1inch) to the horizontal tangent onto the blade tip. It seems that the measurement results of the No. 562 are highly operator dependent. An interesting phenomenon that applies to the No. 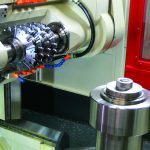 562 unit is that the absolute accuracy of the results is well suited for a correction of blades in order to establish cutting blades within the accepted tolerance. However, the repeatability from blade to blade seems rather fair, which has its cause to the largest part in the aforementioned operator dependency. A complimentary fixture, shown in Figure 3, is used for the comparison from blade to blade within one set. 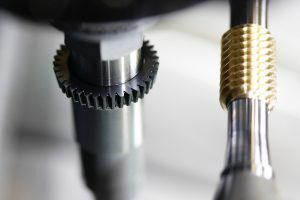 The so-called comparison checker in Figure 3 uses mechanical dial indicators with an anvil that allows a sideways blade location on its two datum surfaces. A reference blade is gently pressed towards the anvil and then shifted axially onto the blade top location stop. In this position the probe tips (linked to the dial indicators) are adjusted e.g. to top and flank points on the cutting edge as well as the clearance side. The probe tips are pointed and therefore have to be located slightly behind the cutting edge. Now the indicators are set to “zero” with a probe deflection equivalent to about two pointer revolutions on each indicator. 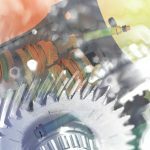 This assures the elimination of stick-slip and provides an adequate pressure between indicator stem and linkage as well as probe tip and blade contacting point. Even though the blade comparison fixture has an obvious dependency on the way the operator feeds the blades into the stop position and holds it there, it still is the most-used device for comparing the blades in a set with the reference blade. Blade comparison utilizing the device in Figure 3 is straightforward and fast, and delivers a sufficient accuracy level in order to prepare blades to be accurately built in a cutter head. 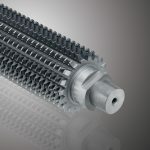 It is a desirable goal to present a blade to a measurement sensor on a stiff and temperature stable structure. The arrangement should have a minimum of slides and rotary axes. 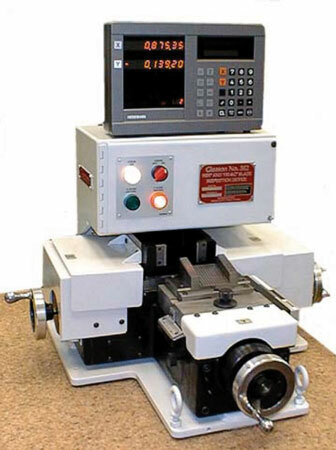 The lowest possible motion travel of the machine axes promises the most accurate and repeatable measuring results. Also, the elimination of operator influence would result in a high repeatability and improve the absolute accuracy in terms of GR&R evaluations. Finally, the speed of a complete blade measurement is a substantial factor for the success of a cutting blade measurement apparatus. An acceptable measurement time for an average blade lies in the vicinity of 30 seconds to one minute. 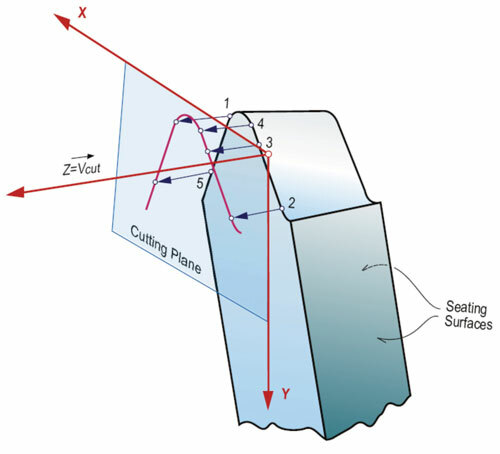 A fast minimum measurement has to be able to capture three points on the cutting edge and two points on the clearance edge, based on a coordinate system which has its orientation from the cutting plane and the two seating surfaces of the blade shank (Figure 4). Such a minimum measurement would correspond closely to the No. 562 device and use the least possible amount of measuring time. 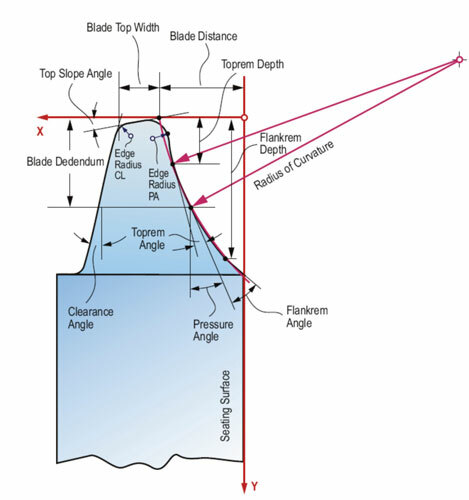 A complete measurement of all blade features would require a cutting edge scanning and a technique to capture the location and shape of the blade front face, as well as the relief surfaces of cutting and clearance side. In both cases, minimum or complete measurement, it is most important to relate all measured points to the correct blade coordinate system X10-Y10-Z10 as shown in Figure 5. 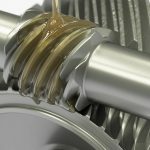 This coordinate system is used to define the “tooth forming contour” of the blade, which defines together with the basic settings the particular bevel gear geometry. The Y10-Z10-axes are aligned to reflect the cutting plane, while the Y10-axis is collinear with the cutter head axis. The plane X10-Z10 is tangent to the top of the blade. 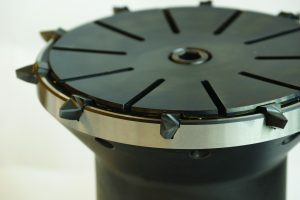 The coordinate origin on the X10-axis lies on the front wall of the blade shank, which is toward the cutter head center. The X10-axis is collinear with the cutting velocity direction, which is not the direction of the front face distance. 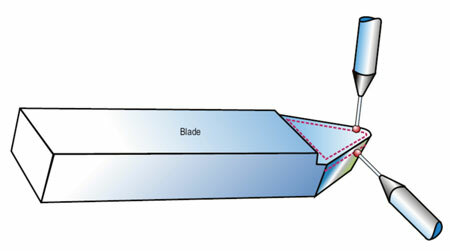 The normal distance from the extended front blade shank wall to the theoretical blade point defined by the blade front face distance determines the location of the front face (in blade thickness direction); this is the definition of the front face distance as shown in Figure 5 . 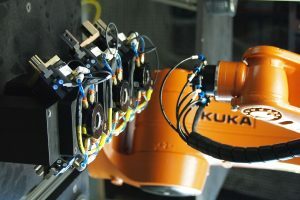 A more advanced and automated measurement was developed on the basis of a three-dimensional coordinate measurement machine using a three-dimensional scanning probe. 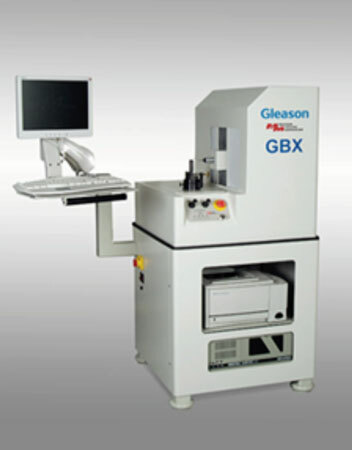 Figure 8 shows the Gleason GBX, a coordinate measurement machine dedicated to cutting blade measurement. 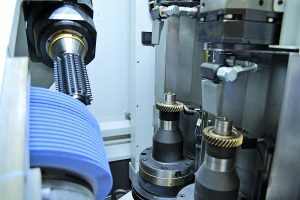 The measurement of the GBX machine takes place at or behind the cutting edge, inside of the side relief surface with the spherical tip of a measurement probe. The blade front face is measured along a triangular path, which establishes the front face surface as a plane using an approximation method (Figure 9). The knowledge of the approximate shape and orientation of the relief surface angles allows the calculation of the theoretically correct path behind the cutting edge (adjusted nominals). The accuracy of this procedure is significantly above the measurement results of the No. 562 device. Beyond that it is possible to evaluate additional blade features versus the No. 562 such as blade curvature radii, Toprem rise, edge radii, and front face distance. Metrology devices, as shown in Figure 1 and Figure 8, are not really suited for a production measurement (comparison) of complete sets of blades after the blade grinding and in order to qualify sets of blades for being assembled in cutter heads. 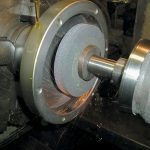 The duration of a blade measurement is in the vicinity of the time it takes to grind a blade, which is not easily acceptable for a production measurement. 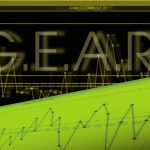 The strength of the Gleason GBX is the fact that it represents a CNC controlled, highly accurate metrology device that is an integral unit together with the blade mathematical software (GEMS) and the control software. 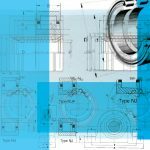 The components of the integral unit work together in a semi real time mode which allows the different measurement steps, like the cutting edge measurement being influenced by the previously conducted front face scanning. A prismatic V-block fixture with a yoke and screw for holding rectangular blades (Figure 10, left) as well as Pentac® blades (Figure 10, right) has been developed. The probe will scan the seating surfaces of the fixture during a setup/calibration mode. 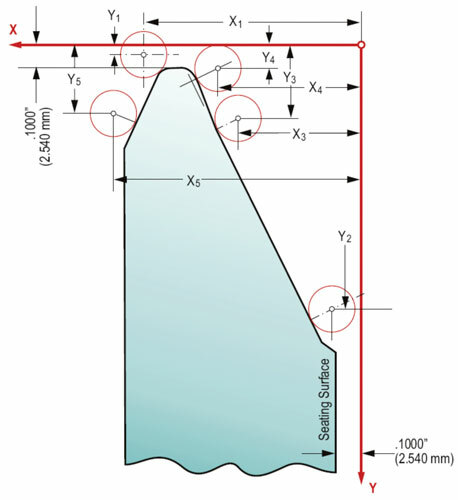 No blade datum surface scanning is required during the regular blade measurement cycle. 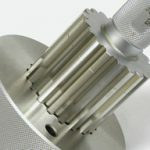 Studies with the newly developed GBX blade holding fixture have shown that the achieved accuracy is high and the repeatability is excellent. 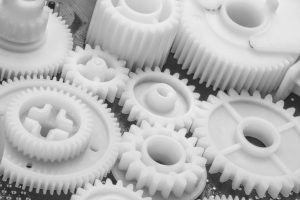 Those attributes are combined with a rather short measuring time because of the elimination of individual datum surface measurements. In a measurement cycle, the front face is scanned first along a triangular path (Figure 9). 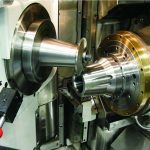 The knowledge of the front face location and orientation is used by the blade mathematical software to calculate the nominal cutting edge function, considering the actual front face. 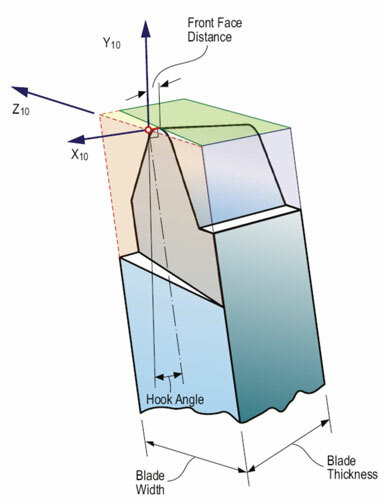 The knowledge of the side relief surfaces is used in order to calculate a scanning path between 0 to 15 µm behind the cutting edge (adjusted nominals). Next, the cutting edge blade tip and clearance side of the blade is scanned. 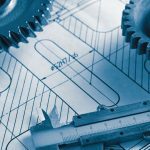 In cases of complicated blade contours, large blade distortions or the requirement of highest accuracy, a software option allows the use of the actually measured blade edge coordinates as “distorted nominals” and repeat the blade edge scanning. The results will be more accurate since the probe deflection is minimized in this mode. 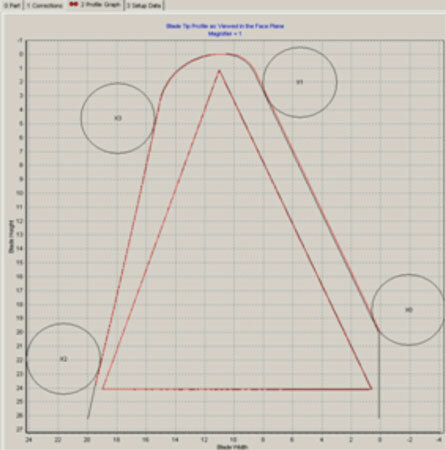 The blade evaluation module receives a measurement result in the absolute blade coordinate system and compares this with the adjusted nominal blade contour behind the cutting edge. The difference between the actual and the adjusted nominal contour is used to compute blade corrections. Figure 11 shows the nominal bade contour (black line) and the actually measured blade contour (red line) in one graphic, together with the No. 562 measurement pin locations. The No. 562 pins are only for reference or comparison with older developments. The experience gained during many measurement studies indicates, that a real comparison between the No. 562 and the GBX is not very useful because the significantly higher accuracy of the GBX leads in cases of small blade deviations to different, but more correct results. In case of three-face ground blades, the mislocation of the actual front face results in a front face distance, side rake, and top rake angle (blade hook angle) correction output. In case of two-face ground blades, the cutting edge and clearance side corrections are calculated such that the correct tooth slot is cut, considering the wrong front face location and orientation. 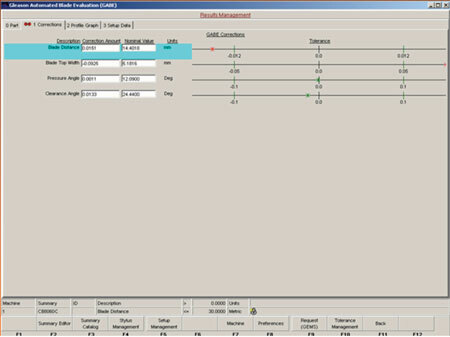 Figure 12 shows the correction output screen of the GBX-GEMS software.